Inflammation can be good or bad, depending on the situation. On one hand, it’s your body’s natural way of protecting itself when you are injured or sick. It can help your body defend itself from foreign invaders, and can stimulate healing. On the other hand, chronic, sustained inflammation in the body can be harmful. It is linked to an increased risk of diseases like diabetes, heart disease, obesity and many others (1, 2, 3). Table sugar (sucrose) and high-fructose corn syrup (HFCS) are the two main types of added sugar in the diet. Sugar is 50% glucose and 50% fructose, while high-fructose corn syrup is about 55% fructose and 45% glucose. One of the reasons that added sugars are harmful is increased inflammation that can lead to disease (4, 5, 6, 7, 8). In one study, when mice were fed high-sucrose diets, they developed breast cancer that spread to their lungs, in part due to the inflammatory response to sugar (6). In another, the anti-inflammatory action of omega-3 fatty acids was impaired in mice that were fed a high-sugar diet (7). And in a randomized clinical trial where people were assigned to drink regular soda, diet soda, milk or water, only those in the regular soda group had increased levels of uric acid, which drives inflammation and insulin resistance (8). Sugars can also cause harm because they supply excess amounts of fructose. Eating a lot of fructose has been linked to obesity, insulin resistance, diabetes, fatty liver disease, cancer and chronic kidney disease (9, 10, 11, 12, 13, 14, 15). Researchers have also found that fructose causes inflammation within the endothelial cells that line your blood vessels (16). High fructose intake has also been shown to increase several inflammatory markers in mice and humans (10, 17, 18, 13, 19, 20). Bottom Line: Consuming a diet high in sugar and high-fructose corn syrup drives inflammation that can lead to disease. It may also counteract the anti-inflammatory effect of omega-3 fatty acids. Just about everyone agrees that artificial trans fats are the unhealthiest fats you can eat. They’re created by adding hydrogen to unsaturated fats, which are liquid, in order to give them the stability of a more solid fat. Trans fats are often listed as “partially hydrogenated” oils on the ingredients lists on food labels. Unlike the naturally occurring trans fats found in dairy and meat, artificial trans fats have been shown to cause inflammation and increase disease risk (21, 22, 23, 24, 25, 26, 27, 28, 29). In addition to lowering beneficial HDL cholesterol, trans fats have been shown to impair the function of the endothelial cells lining the arteries (26). Ingestion of artificial trans fats has been linked with high levels of inflammatory markers such as interleukin 6 (IL-6), tumor necrosis factor (TNF), and C-reactive protein (CRP). In fact, CRP levels were 78% higher in women who reported the highest trans fat intake in the Nurses Health Study (26). In a randomized controlled trial of overweight older women, hydrogenated soybean oil increased inflammation significantly more than palm and sunflower oil (27). Studies on healthy men and men with elevated cholesterol have shown similar increases in inflammatory markers in response to trans fats (28, 29). Bottom Line: Consuming artificial trans fats may increase inflammation and raise the risk of several diseases, including heart disease. Despite what we’ve heard for years, consuming vegetable oils isn’t healthy. Unlike virgin olive oil and coconut oil, vegetable and seed oils are often extracted from foods using solvents like hexane, a component of gasoline. The vegetable oils made this way include corn, safflower, sunflower, canola (also known as rapeseed), peanut, sesame and soybean oils. Due to the structure of the polyunsaturated fatty acids in these oils, they are very prone to damage by oxidation. In addition to being highly processed, these oils promote inflammation as a result of their very high omega-6 fatty acid content (30, 31, 32, 33). Although some dietary omega-6 fats are necessary, the typical Western diet provides may more than people need. In fact, we should be eating more omega-3-rich foods, such as fatty fish, in order to improve our omega-6 to omega-3 ratio and reap the anti-inflammatory benefits of omega-3s. In one study, rats who consumed an omega-6 to omega-3 fatty acid ratio of 20:1 responded with much higher levels of inflammatory markers than the who consumed a ratio of 1:1 or 5:1 (33). Bottom Line: Because of their high omega-6 fatty acid content, vegetable and seed oils may promote inflammation when consumed in high amounts. Our ancestors consumed high-fiber, unprocessed carbohydrates for millions of years in the form of grasses, roots and fruits (34). However, eating refined carbohydrates can drive inflammation, which in turn may lead to disease (34, 35, 36, 37, 38). Refined carbohydrates have had most of their fiber removed. Fiber promotes fullness, improves blood sugar control and feeds the beneficial bacteria in your gut. Researchers report that the refined carbohydrates in our modern diet may encourage the growth of inflammatory gut bacteria that can increase risk of obesity and inflammatory bowel disease (34, 36). Refined carbohydrates have a higher glycemic index (GI) than unprocessed carbohydrates. High-GI foods raise blood sugar more rapidly than low-GI foods do. In one study, older adults who reported consuming the highest amount of high-GI foods were 2.9 times more likely to die of an inflammatory disease like COPD (37). In a controlled study, young, healthy men that were fed 50 grams of refined carbohydrate in the form of white bread responded with higher blood sugar levels and an increase in the inflammatory marker Nf-kB (38). Bottom Line: High-fiber, unprocessed carbohydrates are healthy, but refined carbohydrates raise blood sugar levels and promote inflammatory changes that may lead to disease. In one study, the inflammatory marker CRP increased in people who consumed alcohol. The more alcohol they consumed, the more their CRP increased (39). People who drink heavily often develop problems with bacteria moving out of the colon and into the body. This condition, often called “leaky gut,” can drive widespread inflammation that leads to organ damage (40, 41). To avoid alcohol-related health problems, intake should be limited to two standard drinks a day for men and one standard drink a day for women. Photo Source: National Institute on Alcohol Abuse and Alcoholism. Bottom Line: Heavy alcohol consumption can increase inflammation and potentially lead to a “leaky gut” that drives inflammation throughout the body. Consuming processed meat is associated with an increased risk of heart disease, diabetes, stomach cancer and colon cancer (42, 43, 44). 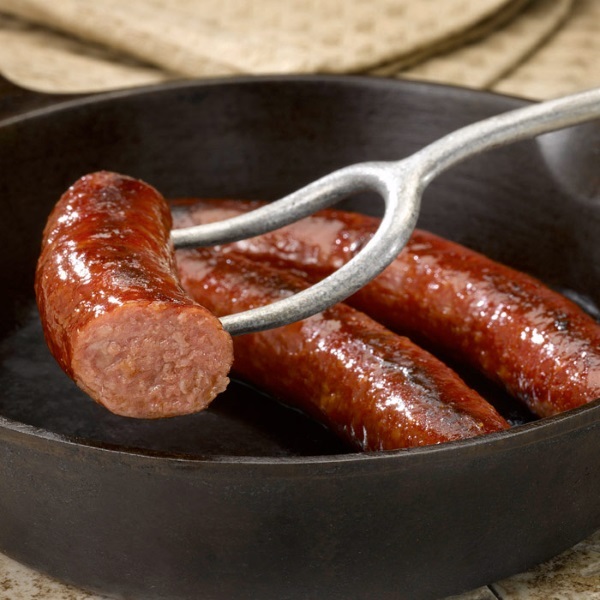 Common types of processed meat include sausage, bacon, ham, smoked meat and beef jerky. AGEs are formed by cooking meats and some other foods at high temperatures. They are known to cause inflammatory changes that can lead to disease (45, 46). Of all the diseases linked to processed meat consumption, colon cancer’s association is the strongest. Although many factors contribute to colon cancer development, one mechanism is believed to be an inflammatory response to processed meat by colon cells (47). Bottom Line: Processed meat is high in inflammatory compounds like advanced glycation end products (AGEs), and its strong association with colon cancer may be due in part to an inflammatory response. Some of these you can’t do much about, such as pollution, injury or sickness. However, you have much more control over the foods and beverages you choose to eat and drink. To stay as healthy as possible, keep inflammation down by minimizing your consumption of foods that trigger it.